Our Women's Ministry was formed to bring women of all ages together for fellowship and growth. We encourage each other to reach out to family and friends with the message of Gods' love as demonstrated through the life, death and resurrection of our Lord & Savior Jesus Christ. Our goal is to strengthen and empower each other thru prayer, studying the word of God, supporting one another & having real discussions about everyday living. very easy to become frazzled in these modern times, but together with the word of God, we can go from chaos to calm. We have created a ministry where we can pray together, cry together, laugh together and rejoice together. Join us monthly on the 3rd Tuesday for Women's Bible Study @7pm. It's that time again. 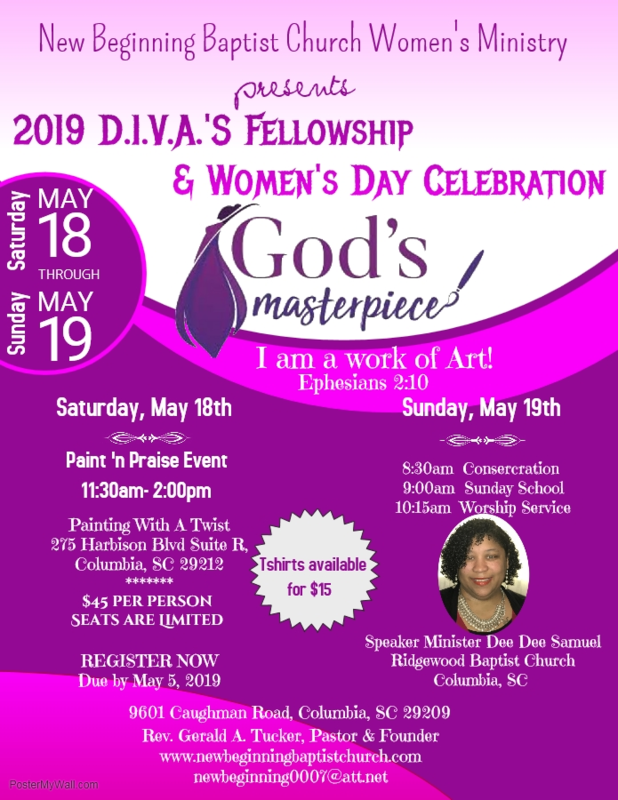 The New Baptist Church Women's Ministry presents our 2019 D.I.V.A. 'S Fellowship & Women's Day Celebration. Our theme this year is God's Masterpiece: I am a work of art! Our theme is derived from Ephesians 2:10. 10:15 am- Worship Service, featuring our guest speaker Minister Dee Dee Samuel of the Ridgewood Baptist Church in Columbia, SC. We would love for you to join. Please complete your registration form, pay for assessment of $45 no later than May 5, 2019, if you would like to join at Painting with a Twist. Seats are limited.